KAROONDINHA MUSIC AND ARTS FESTIVAL INVITES YOU TO EXPERIENCE AMERICA'S WILDERNESS ALONGSIDE CHANCE THE RAPPER, JOHN LEGEND, ODESZA + MORE! Centre Hall, Pennsylvania - Journey to the sprawling 1,600+ acre grounds of Penn's Cave & Wildlife Park, America's only all-water cavern and wildlife park this July 21- 23, with a Kick-Off Party on July 20, to become a piece of festival history as music and nature converge at the intersection of the first annual Karoondinha Music & Arts Festival, a three-day, immersive camping experience. 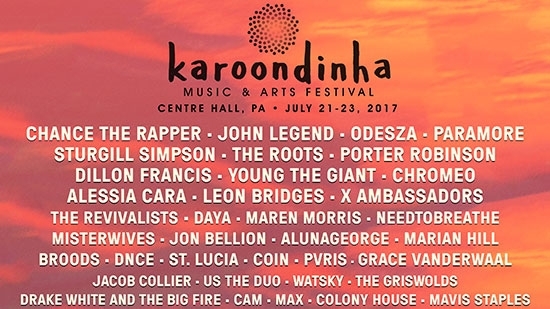 A destination unlike any other, Karoondinha unlocks an extraordinary world with roaming wildlife for a weekend of adventure, gastronomical feasts, freedom and dancing under majestic skies to a colorful soundtrack composed of headlining artists Chance The Rapper, John Legend, ODESZA, and Paramore. Pulsating beats will echo through the famed ancient underground water cave as the top-billed headliners are joined on land by some of today's most-coveted acts; Karoondinha's maiden voyage will welcome The Roots, Porter Robinson, Sturgill Simpson, Dillon Francis, the ever-soulful Leon Bridges, X Ambassadors, St. Lucia, AlunaGeorge, Marian Hill, Young The Giant, Chromeo and over 70 more artists. Assembling an overwhelmingly impressive roster for its first foray onto the festival circuit, the 2017 lineup is a prime showcase of the music industry's vast community of live bands, vocalists, collaborators and producers. As clear blue skies transform to nights under the stars, attendees can explore multiple stages, after-hours DJ sets, and surprise pop-up performances deep inside the alluring water cave (for VIP patrons) -- See below for the full Karoondinha 2017 lineup! Blossoming across the festival grounds alongside intricately built structures are bountiful activations - available day and night throughout the three-day weekend. Inviting attendees to reconnect to their inner brightness, Karoondinha propels experiences far beyond the music, where wanderers may find themselves at a meditation, yoga, or dance class at any given moment. Traverse across the rolling hills and explore immersive art designed by both regional and national creators, move fluidly among native North American wildlife, and embrace an unprecedented opportunity to festival within one of America's most stunning settings. Karoondinha (pronounced ka-roon-din-ha) translated to its origin means 'The Land of Shining Waters', and in honor of its indigenous roots, the festival has mapped out a series of tours to guide revelers off the beaten path and into the wooded forests where the opportunity to [safely] observe mountain lions, wolves, bison, bears, longhorn cattle, bighorn sheep in their natural habitat awaits. Conversely, if your thirst for adventure is best quenched by water, take a guided boat tour of the shimmering pools in the cave below, an unrivaled experience designed specifically for festival-goers. Dazzling tourists from across the globe for centuries, the cave has been in continuous operation since 1885 and boasts a vibrant history that adds to the intriguing legacy Karoondinha is poised to leave for generations to come. Karoondinha Festival offers attendees Single Day, Multi-Day, and VIP passes alongside camping and hotel packages. Plan your Karoondinha experience today - Limited passes available now! Festival Brighter. Be Free. Choose Your Adventure.